Danny Kanell shares his reactions to Megan Rapinoe kneeling during the national anthem as a gesture in support of 49ers QB Colin Kaepernick's message. BOYDS, Md. -- The Washington Spirit prevented Seattle midfielder Megan Rapinoe from kneeling during the national anthem by altering its pregame ceremonies rather than "subject our fans and friends to the disrespect we feel such an act would represent." The National Women's Soccer League team moved up the anthem, playing it while the teams were off the field at the Maryland SoccerPlex. "We decided to play the anthem in our stadium ahead of schedule rather than subject our fans and friends to the disrespect we feel such an act would represent," the Spirit said in a statement. "We understand this may be seen as an extraordinary step, but believe it was the best option to avoid taking focus away from the game on such an important night for our franchise." 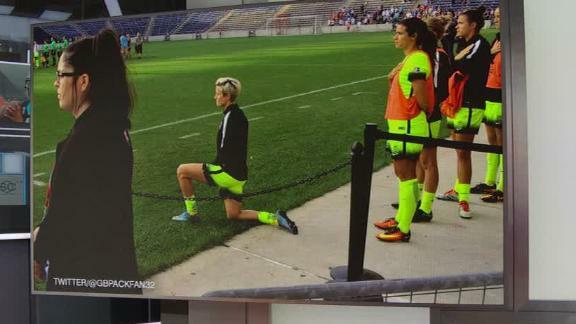 On Sunday before the Reign's match in Chicago, Rapinoe knelt during the anthem in solidarity with Colin Kaepernick, the San Francisco quarterback who has refused to stand during the anthem to protest racial injustice and minority oppression. She said at the time she planned to continue to kneel. "To willingly allow anyone to hijack this tradition that means so much to millions of Americans and so many of our own fans for any cause would effectively be just as disrespectful as doing it ourselves," the Spirit said in the statement. Rapinoe said after the game she was "saddened" by the Spirit's move and took issue with their statement. "It was incredibly distasteful, four days before one of the worst tragedies in our country, to say I tried to hijack this event," Rapinoe said after the game, according to The Washington Post. The Spirit said team owner Bill Lynch is a veteran who has lost friends in overseas conflicts, along with his close friends. "The tradition of honoring our military and our patriotism before our games is very important to us," the statement said. "We strongly feel that there are better ways to begin a conversation about a cause than tarnishing a tradition that is so important to so many." Earlier Wednesday, the Reign said they are standing by Rapinoe. In a statement, the team said it recognizes Rapinoe's action "was offensive to some and a source of inspiration to others." "We will continue to encourage all Reign FC players to participate in the pre-match ceremony, which honors those who have served and made sacrifices on our behalf," the Reign said. "We will also continue to allow players to participate in the pre-match ceremony in a manner consistent with their personal beliefs, reflecting our respect for the rights earned and defended by those fighting for our nation." NWSL commissioner Jeff Plush, who was in attendance at Thursday's match, told The Washington Post he had not been informed of the Spirit's plans. "I would have preferred to have had an honest dialogue of what we wanted to do, what their goals were, and then work through it," Plush said. "I don't suggest I have all the answers, but it's better to talk about it. I'm disappointed." Plush called the topic "an emotional issue." "I'm trying to be aware of that and respectful of different points of view," Plush said. "It's a challenging issue and a challenging time. We've got some issues we need to work through as a country. ... The issue brought forth by Colin and then Megan is a real issue. We need to have serious conversations about it. I don't know whether it belongs on the playing surface. It's bigger than us." Kaepernick drew attention when he remained seated on the bench before a preseason game against Green Bay. Last Thursday night in San Diego, he and safety Eric Reid knelt during the anthem before a game against the Chargers. On Sunday night, Rapinoe kneeled during the anthem prior to the match against the Chicago Red Stars in what she called "a little nod" to Kaepernick. "I think it's actually pretty disgusting the way he was treated and the way that a lot of the media has covered it and made it about something that it absolutely isn't. We need to have a more thoughtful, two-sided conversation about racial issues in this country," Rapinoe told the website American Soccer Now afterward. She went on to say, "Being a gay American, I know what it means to look at the flag and not have it protect all of your liberties. It was something small that I could do and something that I plan to keep doing in the future and hopefully spark some meaningful conversation around it." The 31-year-old Rapinoe, who has played for Seattle since 2013, has been with the U.S. national team since 2006 and has played in two Women's World Cups and two Olympics. She injured her knee last December during training and required surgery, but Rapinoe was able to come back and play in the Rio Games. The United States, which had won three straight gold medals in the sport, was eliminated in the quarterfinals by Sweden. Since coming out in 2012, Rapinoe has been a devoted advocate for LGBT rights and has worked with the Gay, Lesbian & Straight Education Network (GLSEN) and other organizations. Rapinoe also has been vocal about pay equity, and she was among five national team players who lent their names to a complaint filed with the Equal Employment Opportunity Commission alleging wage discrimination. The players claim that members of the team make in some cases up to four times less than their male national team counterparts.